A special Thank you to Bloomsbury and NetGalley for sending me this book to review. How does she do it? How does author Shannon Hale evoke so much emotion from me? How does she make me feel like I have butterflies flying all through my body? I got that feeling when you're just about to be kissed for the first time, you remember don't you? I LOVE that feeling! This book is hilarious. It really is. I was laughing out loud and my husband kept looking over at me wondering why I was laughing to myself. It oozes sarcasm and those inner thoughts we're always having that we never voice, but we totally think those crazy things. You know what I'm talking about. I know you do. This book is why I love reading. As far fetched as a two week Austenland vacation seems, I can actually go there! I can curl up with my book, anytime I want, and take my vacation to Austenland. Thank you Shannon Hale. Thank you for letting me get all dressed up and live a Regency romance in Austenland. Anytime I want. If you've not read the first book in this series you should! 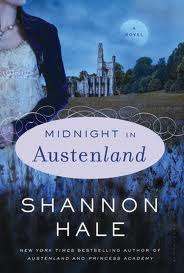 Austenland by Shannon Hale is just as amazing! Don't feel like you have to read it before Mindight in Austenland though, they are about different people, same place. It's a companion novel. Enjoy! Let me know what you think! "You don't have to entertain him," he whispered back. "It is his job to entertain you." I'm excited! Now I have to wait till February!